I recently upgraded my 2015 Sierra SLT to a 2016 All Terrain, a move that I am most pleased with. Among other things, I was excited that the new model offered Apple Carplay. I’m not a total Apple fanboy, but I use their products and was interested to use the new interface with my truck. First let me explain what this truck (as well as my old one) already does with my phone. It automatically syncs wirelessly via Bluetooth. So as soon as I start up my truck, it’s communicating with my phone in my pocket. It will display my contacts, recent calls, voicemails, and I can make a call using the touch display or by voice command. It will display my music content on the screen, and I can scroll through by artist, album, whatever and find what I want. It has a Pandora app that runs off my phone. It will notify me when I get a text, and read it to me or display it (actually that display function is a bit clunky and I’ve never really gotten it to work). And best of all, I can use the button on my steering wheel to do all of this directly with Siri, which is what I usually do. “Read my messages,” “Play Nirvana,” or “Is it going to rain today?” all works through Siri just swimmingly. Now enter Carplay. First I must take my phone out of my pocket, and plug it in. No more handy Bluetooth. It will display my contacts, recent calls, voicemails, and I can make a call using the touch display or by voice command. It will display my music content on the screen, and I can scroll through by artist, album, whatever and find what I want. It will notify me when I get a text, and read it to me but not display it. I can push the Siri button on the radio to access that feature. If all that sounds familiar, that’s because those are all things that I already had access to, without the cord. 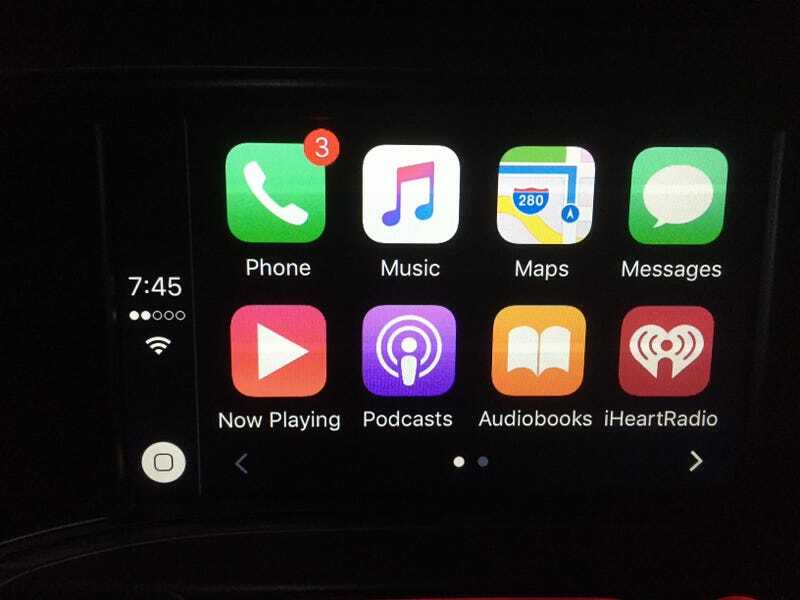 Now, Carplay does allow me to directly access other music apps like podcasts, iHeartradio, and audiobooks that would not directly display with Bluetooth only. They will certainly work with Bluetooth, but I would have to access them by fumbling with the phone itself. It also displays and allows access to Apple Maps, but my truck already has nav, so that’s not useful to me. I can already program a destination by voice command while driving, or using the screen while stopped, or even find it on my Onstar app on my phone before I leave and send the route to my truck so that it will be ready when I get in. So to sum up, in practice Carplay adds no functionality to my Sierra. In fact, it’s much worse and a giant step back because I have to plug my phone in to use it, a practice that I’ve long since eliminated from my routine. I can only see this useful as a complete system for an entry level vehicle that doesn’t already have all these features built in like the GM Intellilink system does. For instance, if a low end car simply offered a Carplay interface as its only function, that might make sense. But I still don’t see why that can’t be done wirelessly. It’s stupid and I’m not using it. Ever.